When it comes to pregnancy and childbirth, there are probably hundreds of books and resources available. 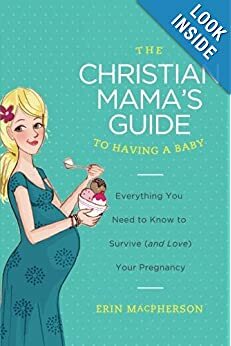 This book, The Christian Mama’s Guide to Having a Baby, strives to be different from the rest, and I believe that it is. The author, Erin MacPherson, writes with such honesty and familiarity, and it felt like I was listening to my best friend talk to me about her experiences as opposed to reading a textbook full of medical terms. She talks about the things that women REALLY want to know about pregnancy and isn’t afraid to talk about the gross stuff. The book is broken down into helpful sections like morning sickness, labor, etc. What really sets this book apart is the focus on prayer and the Bible. In each chapter she provides verses and a prayer for the mother-to-be that will help her stay focused on the beautiful gift that God has given to her. She reminds the reader that God is the best source of guidance–even more so than Google. This book is a great resource and I feel like I learned so much by reading it! She has several other books and I plan to read them all once we enter those phases of life.